Note: We have a new version Bluetooth 4.0 Low Energy - BLE Shield v2.1 instead of Bluetooth 4.0 Low Energy - BLE Shield. BLE Shield stands for Bluetooth 4.0 Low Energy - BLE Shield. 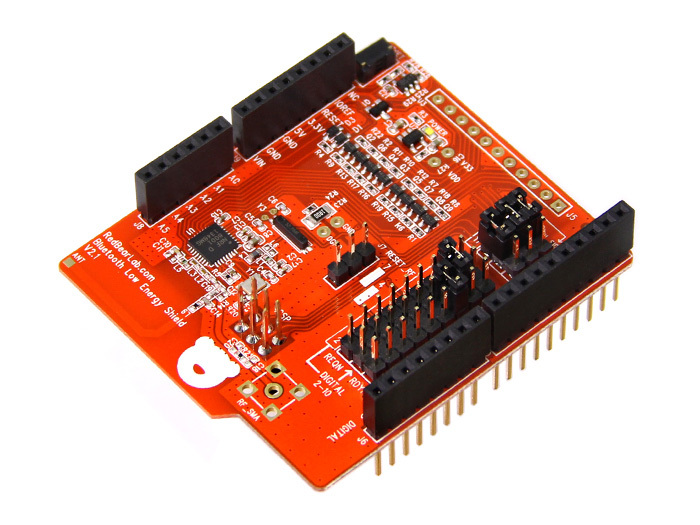 It is designed to work with Arduino boards, including Arduino Uno, Mega and Leonardo. It allows you to connect your Arduino board with other BLE device. With our current implementation, the Shield supports connection between Arduino to an iPhone 4S or iPad 3rd generation. Please visit RedBearLab for more info about this product and technical support. Is it backward compatible with BT 2.0 or older device? For example, could you stream music or videos from an iPhone 4s to this shield to be processed by the arduino it was attached to? Hi, we are only the distributor for this product, hope you could send your inquiry to designer(http://redbearlab.com/), that will be more effective . Thanks for your understanding. please make for android or meego! I want to connect an Arduino via Bluetooth Low Energy to a PC with Bluetooth 4.0 dongle or to an Android device with Bluetooth 4.0.
don't have 4s or 5, Does it work with iphone 4? I bought shield, how could I change UUID (713d0000503e4c75ba943148f18d941e) of shield ? This is Seeed Tech Team,and this product is a external source,so you can get in touch with http://redbearlab.com/ derectly.Thanks. I was confused too, with the url. I bought the cheap one and then show you re-stocked the expensive one and i was wondering what the price difference was about. Since, it's the same module, i am happy!